“Sound Digressions : Spectrum” is a limited edition clear vinyl album produced by Gallerie Mitterand for Tony Oursler‘s sound installation of the same name. featuring JG Thirlwell, Tony Conrad, Kim Gordon, Ikue Mori, Lee Ranaldo, Stephen Vitiello and Zeena Parkins. The album is a limited edition. For the Sound Digressions series, Oursler worked separately with the seven performers and combined these recordings in a perpetually phasing, playback system. The resulting installations have the effect of a living, ever changing composition for the viewer. 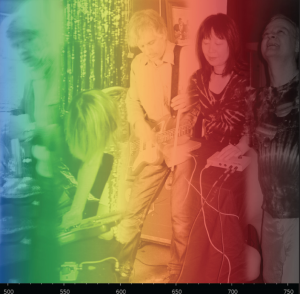 These musical performances, shot in 2005, were originally conceived as raw material for the seven-part series, based loosely on the relationship between sound and the color spectrum. The previous installation, Sound Digressions in Seven Colors was shown at NYEHAUS New York in 2005.